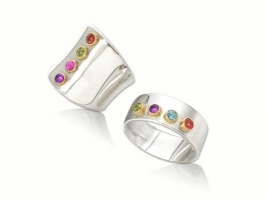 sterling silver ring with four gemstones set in gold 18k. Handmade sterling silver ring with four semiprecious gemstones set in gold 18k. Creativity and design in each of our pieces. 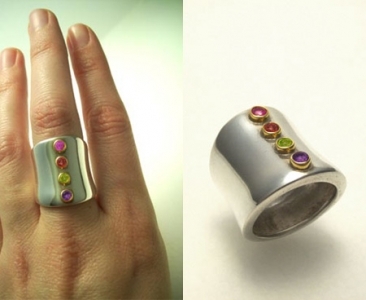 Gemstones: amethyst, peridot, garnet and rose of france. Available other stones. Choose the one you like. Sizes 6 and 7 3/4 only in stock, other sizes made to order 1-2 week delivery. 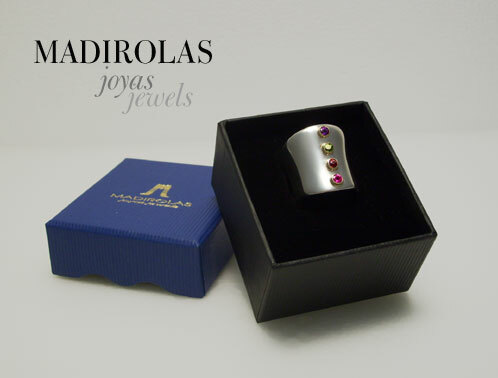 All of "madirolas" jewels are presented in custom boxes, adding a unique touch to a design gift. All designs and images are the property of MADIROLAS JOYAS and have copyright protection. They may not be used without permission.